Click the triangle to play. Click (or right-click) the link to download. I started this album in June 2015. The Death of Finbar McGrath, after the passing of Finbar. It is an attempt to find peace in music, space and time. It also aims to spread peace through the lyrical messages within the songs. The tracks are heavily based on technology, including the TC Helicon VoiceLive 3, Ableton Live, Ableton Push, and the Roland RC-50 looper. On many of these tracks I play guitars, bass, and synths (synth-bass, keyboards, drum pads). Compositionally, "peace" is a solo effort, now that Finbar is gone. Live performances will include the fine Bay Area musicians that have joined Universal Fun Machine previously. The work includes sessions done with bassist Richard Berman, who joins me in Universal Fun Machine these days, however, I play bass on all the tracks on this page. here are demos, fragments, and ideas, and will be updated until the full album is assembled. 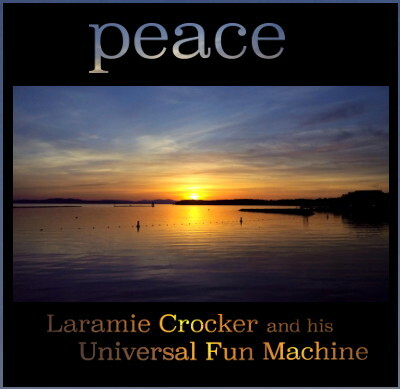 Please visit my homepage here: LaramieCrocker.com, and my  other albums.